If you’re like me, you’re always looking for healthy ways to both entertain and delight your dog. My husky Splash has always been a bit picky when it comes to chews and treats. Most of them, she won’t touch. I’d heard about Himalayan chews but hadn’t tried them until about 9 months ago. The second I pulled it out of the bag, her blue eyes lit up. She was hooked. She barely put it down for 5 days! Here’s a video I recently took after giving her one. She got a little too excited! So What’s So Great About Golden Yak Chews? We’ve known for years now that rawhide can cause blockages due to its non-digestible nature. And while many pups LOVE bully sticks, but they’re not everyone. 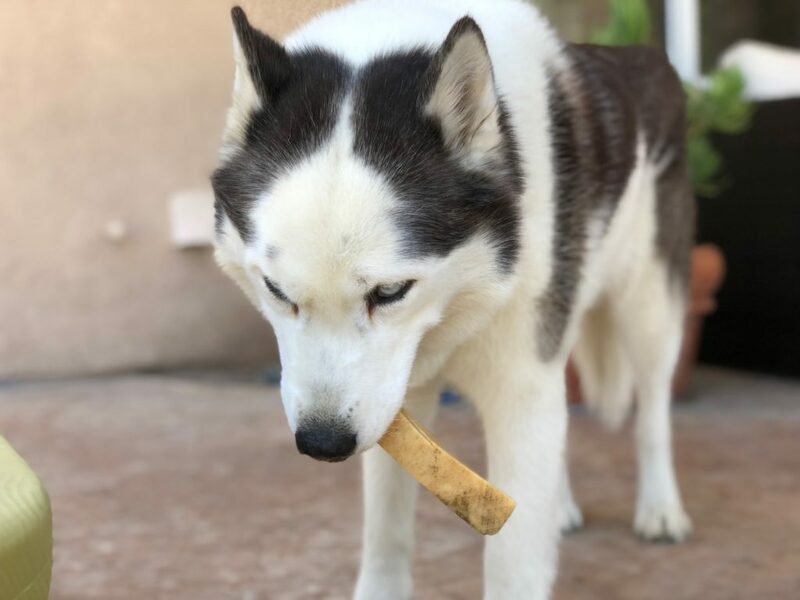 The best bully sticks have quite the odor, and are recommended for outdoor use. In recent years many dogs and owners are discovering the joy of Himalayan chews. These bizarre looking hard cheese sticks have a very interesting history. Golden Yak Chews were originally created by farmers of the Himalayan regions of Nepal, as they have known about the nutritional and teeth benefits of yak milk for centuries. Yak milk for the chews is produced in the Himalayan mountains at an elevation of more than 15,000 feet, using an ancient recipe. Once small piece is left over, you can take it away, microwave it, and it puffs up into a new safe crispy cheese snack! Here at iHeartDogs, we spent the last 6 months sourcing the best quality Himalayan chews for both our pups and yours. We’re pretty proud to release our Golden Yak ™ Chews. We think your dog(s) will absolutely love them, like ours do. As you can see below, Splash won’t put it down!